Daniel Zettl Reel 2012 from Daniel Zettl on Vimeo. 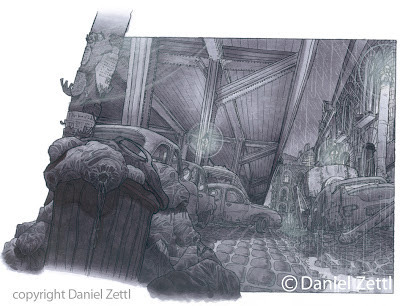 We would like to welcome Weta Animator, Daniel Zettl. Thank you Daniel for taking part in this interview. Can you tell us a little bit about your background and when you decided you wanted to be an animator? 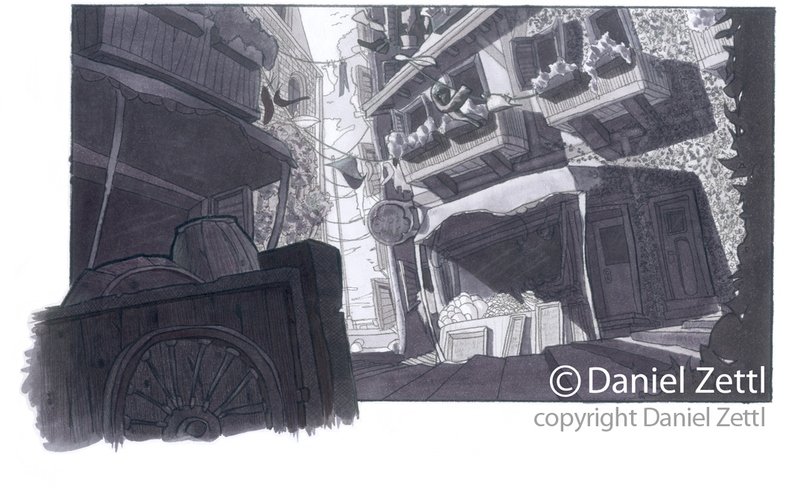 Did you have any traditional 2D animation background when you started? I've drawn and painted since I was little. When I was around 16, I started to do graphic design and graffiti professionally. At the age of 20, when I finished my secondary school, I had an interesting portfolio to apply for an internship at a 2D animation studio in Munich. For me it was the closest to illustrating comic books I could imagine back then. Waiting for a spot to study communication design, I worked my way up within 6 month from a storyboard assistant, to a prop-location and character designer for an animated TV series called Lilly the Witch. My hand drawn animation skills were very basic; I hadn't worked in a production as 2D animator yet. I must say 2D animation was somehow inaccessible and very abstract for me to get interested at first. But, once I understood that drawing for animation is the complete opposite of illustration, and I learned about acting and how to bring a character to life over a series of drawings, animation had my heart and soul! After various design pitches I had done for the studio, I taught myself 3D as a generalist and I had the fortune to get boosted by several animation veterans there. 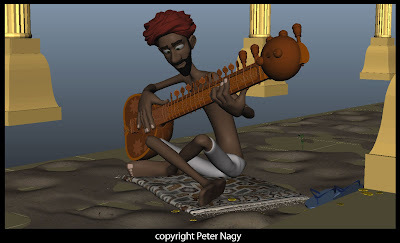 By then, I wanted to learn everything about 3D and get my hands on modeling, rigging and animation. 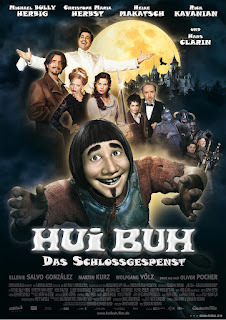 I was offered my first animation position for the German feature film Hui Buh when I was 21 years old. I was part of the character design for the two CG characters, and I even designed and modeled the second character for the movie, a cartoony ghost designed like a pillow. This was also the first time I learned about FACS based facial blendshape systems and implemented this system for the cartoon character. I had the great luck to get under the wings of Tahsin Özgür, a 50-year-old animation director who brought tremendous knowledge from years of experience at Disney. His sense for appeal and cartoon acting resonated immensely with me. I think your shots from CA Scanline, which can be seen on your latest showreel, are amazing with solid acting, great poses and timing. What were some references or materials you drew upon that influenced you on this shot? What were some of the questions/thoughts going through your head while working on this shot? Lissi, this female character is well known from comedy sketches in German TV. The director of this movie is one of the biggest German comedians. He established the character of this princess over many episodes in his TV show, so I kind of knew already a bit of her story. I’m a huge fan of appeal, and that was my main priority for her. I wanted to portray her as the cutest and most girly character I could imagine. But interestingly enough my only reference was the director acting her out for some shots. I absorbed his gestures and timings, his personality and charm. Because in the TV sketches he plays the princess himself, and everybody knows that it’s him in the dress. In your past blog posts you really hammer in timing, while staying really rough in your first pass, have you always had this mentality as an animator or did you work differently when you were starting out? I definitely started out less flexible. In the beginning I was heavily influenced by my 2D upbringing. I animated some of my shots in 2D before I stepped to the computer. I would thumbnail and film myself or I dug through film reference so much that when I did my first blocking in 3D, I knew each pose and timing already and I went mostly with my first idea. I drew lots of reference from Disney and Dreamworks movies back then. But, this was for productions that had extremely short schedules and didn’t leave room for lots of iterations. I still do a ton of reference shoots and drawings today and would pitch these, but now it’s more important to react quickly to new ideas about a performance until we found the perfect one. Good timing is the baseline for any concept though, so this still accompanies me. You spoke very highly of Shamus Culhane's book "From Script to Screen", what were some of the things you extracted from his book and how did it affect your creative process? By no means am I a Shamus Culhane expert, I’m just an insanely big fan of his work. I my eyes Culhane found, through several specific exercises, a way to tap into your unconscious. One of these exercises teaches how to switch your creative or logical brain half on and off at will and go wild with ideas, or be as analytic as possible. He provides 3 characters of different designs, brothers I think. You pic one emotion or a specific action, say joy, or anger or shopping- whatever. And once a day you sit down for one hour with a timer and do 1 drawing per minute. That is at least 60 drawings per hour, soon you’ll be doing heaps more and in a quality you thought you could only do with a model. After a few weeks or a month, you're a completely different craftsman. It’s indescribable. You literally can span pages full of poses of one specific topic within a set amount of time in a crazy quality. Along these lines I want to recommend Kimon Nicolaides “The Natural Way To Draw” and Constantin Stanislavki’s books about method acting. The first one teaches you to put your thinking aside and draw only what you see by not looking at your paper while drawing. And Stanislavski teaches how to immerse yourself fully into a character by creating the emotions inside of you and basing them on real experience memory. In your personal blog, you encourage animators to be comfortable with deleting their work if it's not working out. Can you share with us any personal experiences where you put in a lot of effort on a shot, then scratched it, and had a better outcome? This can happen on every second shot I work on. I pitch a good solid idea, interesting and nice texture but once I hit the polishing phase or once the prior/next shot falls into place and I notice there's one beat to much or the distance the character covers is too long and the shot is too long or too short and the cut doesn’t flow as good, I need to make big changes or delete maybe already polished beats. The cut and flow of the story is really what dictates a change of the performance. In general, when I work really intensely on a shot and want to get it perfect, the best thing is a couple of fresh eyes, who are entirely detached from the shot. Since I started out, and every day again, I try to acquire this “always objective eye” towards my work. I try and preserve this first impression of a shot. This usually leads to the right intuitive decisions, but it can often mean to do big changes. Well thanks for being apart of this latest AnimSchool interview. Tony Bonilla, reviews Camilo Guaman's animation from his Animating Characters class. In this assignment students focus on interacting with a heavy object. 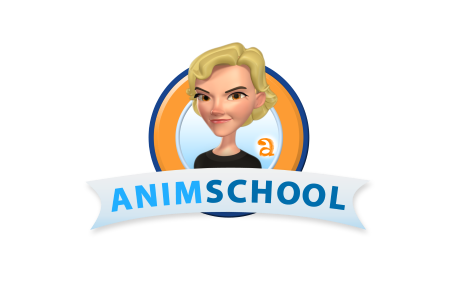 AnimSchool has these General Reviews every week for students who can't attend their normal class review, or for those who want an extra critique. AnimSchool Instructor, Tony Bonilla, continues his smear frame lecture by showing how to deform the arm, to help show anticipation while creating fluid arcs. We welcome back Peter Nagy! Thank you Peter, for taking the time to answer more of our questions. In your winning 11 Second Club entry entitled "Mother Earth," what were some of the most challenging parts of these shots? After a sudden movement, I polished the settling elements of the head and face further than it was necessary. However, the most difficult part was not connected to the movement but the closing pose and facial expression of the street musician. This was the most sensitive part of the shot- the reaction itself. How the character reacts after a negative attack. What is the character like- somebody who feels hurt after this and attacks back, or a calmer self-confident and wiser character? I wanted a mixed face expression here, showing pride, and a bit of anger at the same time. When I finished the animation, I wasn’t content with this part, but now I got used to the closing. Can you talk about your process, from the planning to animation, on your "Mother Earth" piece? When starting a dialogue or acting piece, what method or process do you use to get into the mind of the character? Resetting of the correct lip sync is always based on the original film. For the movement of the character I always consider his personality, who he is in reality (where he is from, where he is heading etc.) According to my story, they are brothers. It’s their story, so there's an unbreakable bond between them. Therefore, both of their reactions are moderate. During the shots I try to get every prop that appears in the final 3D scene. So, if there's a turban on the character’s head, I put on a cap. If the character smokes, I lite a cigarette – or at least I put a cigarette in the corner of my mouth. One never knows, it might happen that when I talk, I might blink more or set my eyebrows differently. I might snap at my head to scratch my forehead, or to adjust my cap. You never know what tiny gestures come during it. These are the unpredictable small bits that make the character and the shot alive, so it is worth nipping them. Props are always a big problem for me. For example, I needed a sitar. Since I neither had a sitar, nor a guitar at home, I suddenly grabbed a broom which was suitable. It's very important to be in contact with similar object as my characters when playing them. Do you bring any of your methodologies of traditional 2D animation across to your 3D animation and vice versa? And if so, how do you think they inform each other? Can you provide us with any past experiences where these methodologies really pushed your shot? 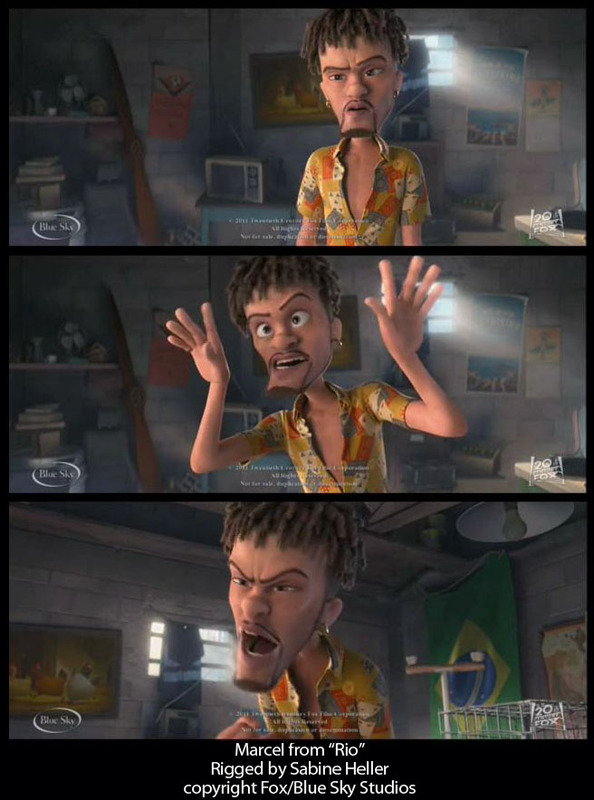 2D has an effect on everything, every workflow of every animation technique, it is in the background. When I start the animation of the 3D scenes, I draw one or two sketches unaware, searching for the poses of the character. I'm probably not saying anything new, but today 3D animation is more alive, the lumpiness and stiffness which was characteristic at the beginning has ceased, and now any ancient 2D trick can be done with the characters (squash & stretch, or even multiples). So, if I keep these traditional basic rules in mind, I would say this work of mine was more successful than some previous ones because I could handle/treat the limbs more freely and I could make certain bends and stretches I didn’t have a possibility to do before. I just loved tinkering with these settings, and in the meantime, I had some nostalgia over the memories of old times. You obviously have experience with how the competition is handled on 11 Second Club, with your entries always being in the top 10s, 20s and 50s. What do you think it is about your shots compared to the rest that make the audiences vote for your animations? What advice and tips can you provide to new animators who want to take part in this monthly tradition? This is a complex thing and quite unpredictable because if a new character appears, whom we haven’t seen before, it can help the competitor to success. For me, the most important thing is always the idea, the story, how the actions react to the dialogue, how much they exploit its possibilities, and also the quality of the animation. These are my main aspects at the evaluation. The problem with my first two works is definitely their topic not being that popular – besides the weaknesses of the animation. Only after that, I realized I have to handle the topic not just to amuse myself with the result, but everybody should understand what I was trying to say. With 3D work the appearance is also important (if we aim the top positions). 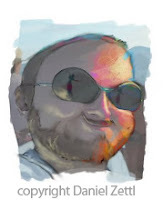 If I handed a view-port animation in January there couldn’t have been smoke in it either, the character would not have smoked and without the present environment it is questionable whether the closing and most important information would have been understandable. The most vital, they should not want to win with a render because the audience will appreciate it. It can also be an aspect whether the competitor enters his work on the forum because with a promising animation he can already find some supporters. Many, many tiny aspects. How up-to-date you are (I mean, do you react to the actual season, holiday?) I think the thumbnail is also important. Another crucial issue is that it should be easy to identify. It should be specific. It should have a distinctive feature, it can be anything (beside the beautiful animation). It can be the character’s appearance or an object from the shot. If you talk about the works with your colleagues at lunch after voting, all of you must think of the same: Ah, that Pinocchio one? Or: Ah, that nice stop-motion animation? Or: The one where the dishes fly off and slow down in the air? The one with the priest? The one with the split-screen? The one with the subtitle? And so on and so on. The most important: concentrate on the animation and the idea! Or, simply just think of your own eCritique! Be critical about your own work and ask the question: does the character move enough in my scene? Is there enough movement? Is that amount of movement necessary? Are there any subtle details to temp the viewer back to see it again? Aspire that your work be a good base material for a winner critique. And lastly, what can we expect from you next? 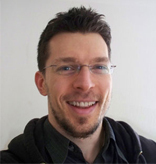 AnimSchool welcomes Mike Mattesi to the team. In his first class, Mike explains his new role at AnimSchool and dives right into drawing over students' work to show "force" in a pose. All AnimSchool students are welcome to be a part of Mike Mattesi's class and have their drawings and animations reviewed. Thank you Sabine, for taking the time to answer a few questions for us. Can you tell us a little about your background, what schools you've attended and why you decided to become a rigger? Everything started with my studies in Media System Design at the University of Applied Sciences in Darmstadt, Germany, in the year 2000. At that time, 3D animation had not yet been integrated into the program, and instead, my classes were a mix of design, economics and information technology. After I discovered that I was mainly interested in design and programming, I decided to do a summer internship at IBM: Java programming. Somehow, I realized that this was too dry of a subject for me and I tried to find a field that combined technology and creativity. 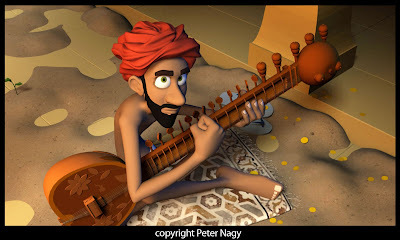 Since I was fascinated by the early 3D animated movies and short films, I found it in 3D animation! More precisely, in 3D Studio Max which I was learning at home besides my studies. Excited by this medium, I decided to put all my efforts in getting an internship in Hollywood, which I though would be the best place to start. Of course, I didn't have any connections nor idea which companies where out there, so I looked up a whole bunch of effects companies in the internet and sent over 100 application letters via email. I was lucky and Gentle Giant Studios offered me an internship in 3D scanning. Afterwards, everything went straight towards a career in animation. I returned to Germany, to finish my studies in Media System Design. After my graduation, I decided that I wanted to deepen my knowledge in 3D animation even further and moved to New York to study towards my Master's degree in Computer Art at the School of Visual Arts on a Fulbright scholarship. After I received my degree in 2006, I returned once again to Germany and worked there for three years as Technical Director at Spans & Partner, an advertising studio in Hamburg. 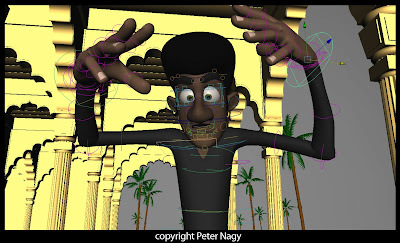 My responsibilities included the development of pipeline tools, special effects, set supervision and also character rigging. Funny enough, even though I always wanted to be an Effects TD, it turned out that rigging was actually what I enjoyed most of all my responsibilities! So, I decided to apply for a Character TD position at Blue Sky Studios when they had an opening in 2009 and voilà, I was lucky and got accepted. You've worked in commercials and now film. What are some differences you've experienced in the two industries? One of the major differences is the duration of a project. At a commercial studio for example, you might have a month or even a couple of weeks to finish a project. Also, the commercials are extremely short and whatever character you rig only has to hold up for this short amount of time. At a film studio, it's possible that you work for more than a year on one movie. (By the way, this also means that after three years of working at a film studio you might only have one project to add to your demo reel.) The movies are normally 90 minutes long, so whatever you do, your character better hold up for a large number of shots. The quality of your rigs in film has to be much higher than in commercials. Summarizing, working in commercials has the advantage of being able to work on many different projects within a short time. However, the commercial industry is definitely faster paced with less time for detail, and can be quite exhausting. You started your career working in Germany and currently you're working in the United States. Did you experience any differences with working for an European company vs US company? Were there any programs you had to learn and how hard was it to make the transition? For me personally, the difference between Blue Sky and my work in Germany was all of the above plus the transition from a commercial to a film studio. At first, I was a little nervous about being able to fulfill the expectations, especially, since I had to switch from XSI to Maya within a week. But luckily, it turned out to be not such a big deal at all. Congratulations on recently being promoted to Creative Lead for Faces. What new responsibilities come with this role? Thank you! I am very excited that I have been given this new responsibility. The role of a 'lead' in the rigging department is alternating for every show. Normally, we have four leads, each one responsible for a certain area. The creative face lead, together with the technical face lead and the character development supervisor, determines the standards for all the face rigs on a movie. This basically means, that all the basic controls and functionalities of the face rig are laid out before the actual character rigging starts. This is often done by developing a prototype. The work on the prototype also helps to define the rigging workflow. 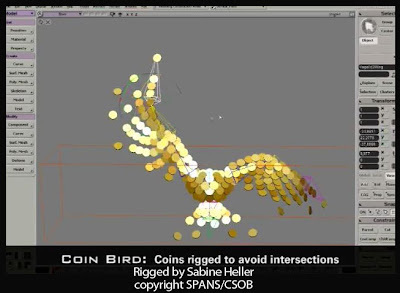 In addition, the creative face lead creates and updates all the documentation necessary for the rigging workflow. Once this is done, the face lead supports and accompanies every rigger in the rigging process of their character. In Rio you rigged Marcel and in the upcoming release of Ice Age 4, you rigged Shira, a Saber Toothed Tiger. Are there any different challenges that come with rigging a bipedal vs a quadrupedal character? Yes, one of the main differences is that quadrupedal characters have another leg setup. For Shira, the main difficulties were her front shoulders and upper arms. Shoulders are generally not an easy area in rigging and Shira required very special attention, because of the way the shoulder blades move under the skin when tigers, for example, walk. Since Shira is a girl, she had to look elegant and female. Still, she is a tiger and needed to be strong. This turned out to be especially tricky, not only in her shoulder, but also in the face. For example, she needed to be able to show anger, but at the same time you didn't want to loose her femininity. This resulted in a lot of subtle back and forth until it felt right. Lastly, what is your favorite type of character to Rig and why? My favorite characters are the ones which provide a challenge. For example, this could be a technical challenge caused by the design which requires some out-of-the-box rigging approach. I have a particular liking for villains or the funny, odd characters. Most of the time, you can give the face a much more extreme range than when rigging a 'good', more 'normal' character. In AnimSchool's Introduction to Rigging class, Sabine explains the difference between IK and FK. AnimSchool presents: Pixar Animator Mark Harris, reviews an animation by Peter Nagy!